MDFA-DeepLearning is a library for building machine learning applications on large numbers of multivariate time series data, with a heavy emphasis on noisy (non)stationary data. The goal of MDFA-DeepLearning is to learn underlying patterns, signals, and regimes in multivariate time series and to detect, predict, or forecast them in real-time with the aid of both a real-time feature extraction system based on the multivariate direct filter approach (MDFA) and deep recurrent neural networks (RNN). The feature extraction system utilizes the MDFA-Toolkit to construct K multivariate signals in real-time (the features) where each of the K features targets a certain frequency range in the underlying time series. Furthermore, each (or some) of these features can also be forecasted multiple steps ahead, or smoothed, creating many possibilities of signal or regime learning in time series. For the deep learning components, in this package we focus on two network structures, namely a recurrent weighted average network (RWA Ostmeyer and Cowell) and a standard long-short term memory network. The RWA cell is a type of RNN cell that computes a recurrent weighted average over every past processing timestep, unlike standard RNN cells which only process information from previous timesteps. The overall general architecture of the proposed network is given in Figure 1 in the case of an RWA network, which we will discuss in more detail below. For a given sequence of N multivariate time series values which have been transformed appropriately to a stationary sequence, which we denote Y_1, Y_2, …, Y_N, a real-time feature extraction process is applied at each observation which is then used as input to an RWA (or LSTM) network, where the univariate output is a targeted signal value (regression) or a regime value (classification).. The MDFA-DeepLearning approach differs from most machine learning methods in time series analysis in that an emphasis on real-time feature extraction is utilized where the features extractors are build using the multivariate direct filter approach. The motivation behind this coupling of MDFA with machine learning is that, while many time series decomposition methodologies exist (from empirical mode decomposition to stochastic component analysis methods), all of these rely on either in-sample decompositions on historical data (useless for future data), and/or assumptions about the boundary values, neither of which are attractive when fast, real-time out-of-sample predictions are the emphasis. Furthermore, simply applying standard recurrent neural networks for step-ahead forecasting or signal extraction directly on the original noisy data is a useless exercise – the recurrent networks typically will only learn noise, producing signals and forecasts of little to no value (in most cases, the latter). Observational labeling: every time series observation is labeled by a signal value (for example a target value computed by a symmetric target filter). 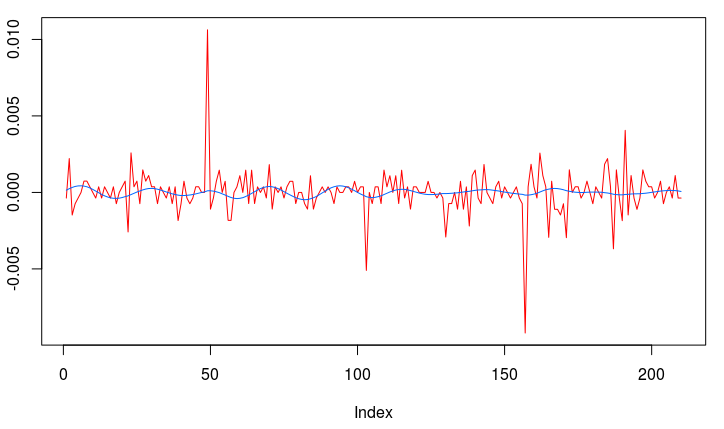 This is sequence-to-sequence labeling for time series regression. Fixed Period labeling: every period (day, week, etc) is labeled, typically by a one-hot vector. This is sequence-to-value labeling. The end of the period is labeled and the rest of the values are not (masked by nonvalues in the code). Regime labeling: every value in a specific regime is labeled, either by a one-hot vector (for example, long (1,0) short (0,1) neutral (0,0), or trend (1,0) and mean-reverting (0,1)). This is another example of sequence-to-sequence, but using one-hot vectors and now in the form of sequence classification. Other labeling strategies can certainly be used, but these are the three most common. We will give an outline on how to create a custom labeling strategy in a future article. The package contains a feature extraction class called MDFAFeatureExtraction which, when instantiated, is used as the input to the a DataSetIterator. The MDFAFeatureExtraction contains a default automated feature extraction builder where a value of K is given as the number of features and a lag to indicate smoothing or forecasting steps-ahead. 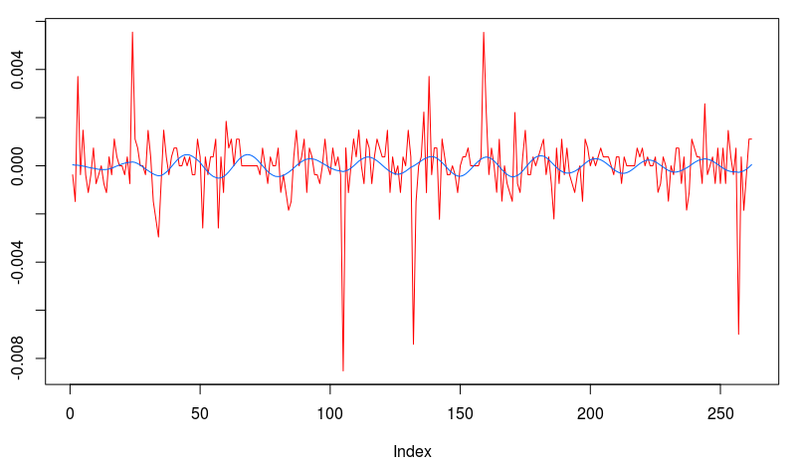 One application of the MDFA feature extraction tool is to decompose a multivariate time series into K components in real-time which are close to being “orthogonal”, meaning in this sense that the frequency information from each of the components are relatively disjoint. A precise mathematical formulation of this property and examples of the MDFAFeatureExtraction to follow. Another example used for turning-point detection in trends is to decompose the multivariate series into K number of low-frequency components with different speeds and forecast/smoothing characteristics. The DataSetIterator is an interface for ND4J that handles fast N-d array manipulation akin to numpy in Python. More specifically, the DataSetIterator handles traversing through a dataset and preparing data for a recurrent neural network. Our datasets in this package are outputs from the TimeSeries through the MDFAFeatureExtraction objects which then become the input to the RNN network. The DataSetIterator also performs the labeling and how output will be arranged. Thus it is essentially the communication from the underlying time series to the extraction process and then how it is treated as input and output to the RNN. 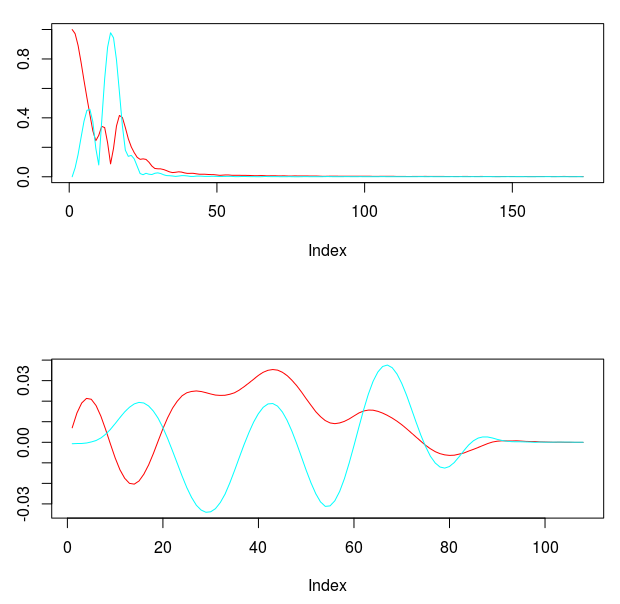 In the package, we have designed two examples of DataSetIterators, one for regression and one for classification, that will be described in more detail in a later article. Finally, the learning interface is where the final network is defined, all the parameters of the network, the activation and loss functions, and number/type of layers (LSTM, FeedForward, etc). The underlying computational framework for this component uses DeepLearning4J. MDFA-DeepLearning requires both the MDFA-Toolkit package for constructing the time series feature extractors and the Eclipse Deeplearning4j (dl4j) library for the deep recurrent neural network constructors. The dl4j library is freely available at github.com/deeplearning4j, but is included in the build of this package using Gradle as the dependency management tool. The back-end for the dl4j package will depend on your computational hardware, but is available on a local native basis using CPUs, or can take advantage of GPUs using CUDA libraries (CUDA 8.0 was used to test current version of MDFA-DeepLearnng). In this package I have included a reference to both versions (assuming a standard linux64 architecture). The back-end used for the novel feature extraction technique, as mentioned, is the MDFA-Toolkit (available here), which will run on the ND4J package. The feature extraction begins by defining K MDFA objects, called MDFABase from the MDFA-Toolkit, with the fixed parameters set for each MDFA object. For example, here we define K=4 MDFABase objects, that will be used to extract different types of trends at different speeds in a fractionally differenced time series. Please refer to the MDFA-Toolkit documentation for more information on the definition of each MDFA parameter. More concrete, in-depth step by step examples and tutorials will be given in the source code on github and in this blog, but here we will just give a brief overview on an example main program using these features. The .csv time series data file from which the DataIterator will extract the time series data for both labeling and learning. Two data sets will be created from this, a train set and a test set. Referrencing to multiple files from which to extract training and test sets is also possible. In dl4j, training and test data is built in the form of a DataSetIterator interface (org.nd4j.linalg.dataset.api.iterator). In the package, we have defined a MDFADataSetIterator and a MDFARegressionDataSetIterator. More DataSetIterators for various applications will be added on an ongoing basis. The network RecurrentMdfaRegression is initiated, and needs to contain the feature signal extractors. Any set of feature extractors can be added, here we used the ones defined above as an example. Finally, the LSTM (or recurrent weighted average) network parameters need to be defined, this will then be used to construct the layers of the recurrent network. With these three steps defined the network should be ready to train and test. The challenge is of course defining the feature extraction parameters. In later articles, we will give tips and tricks into what works best for what type of learning applications in large time series. The multivariate direct filter approach (MDFA) is a generic real-time signal extraction and forecasting framework endowed with a richly parameterized interface allowing for adaptive and fully-regularized data analysis in large multivariate time series. The methodology is based primarily in the frequency domain, where all the optimization criteria is defined, from regularization, to forecasting, to filter constraints. For an in-depth tutorial on the mathematical formation, the reader is invited to check out any of the many publications or tutorials on the subject from blog.zhaw.ch. A fractional differencing optimization tool for transforming nonstationary time-series into stationary time series while preserving memory (inspired by Marcos Lopez de Prado’s recent book on Advances in Financial Machine Learning, Wiley 2018). Generalization of optimization criterion for the signal extraction. One can use a periodogram, or a model-based spectral density of the data, or anything in between. Build a filtering process from simpler user-defined filters, applying customization and reducing degrees of freedom. To start the most basic signal extraction process using MDFA-Toolkit, three things need to be defined. In the current version, time series data is providing by a streaming CSVReader, where the time series index is given by a String DateTime stamp is the first column, and the value(s) are given in the following columns. For multivariate data, two options are available for streaming data. 1) A multiple column .csv file, with each value of the time series in a separate column 2) or in multiple referenced single column time-stamped .csv files. In this case, the time series DateTime stamps will be checked to see if in agreement. If not, an exception will be thrown. 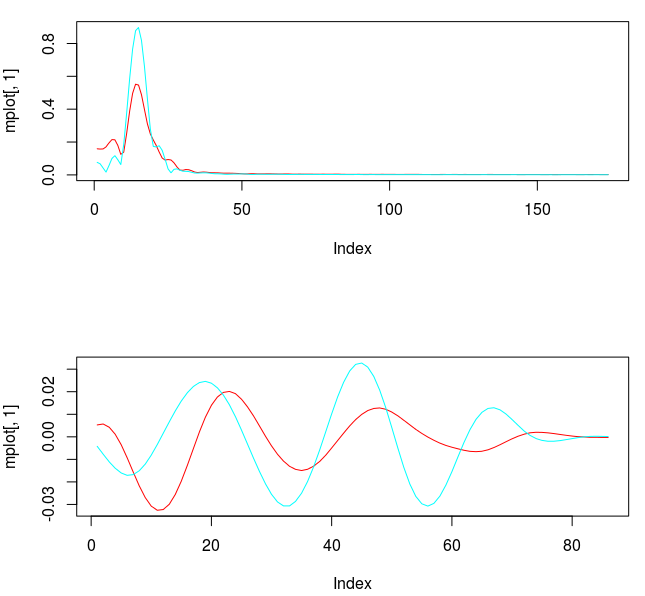 More sophisticated multivariate time series data streamers which account for missing values will soon be available. 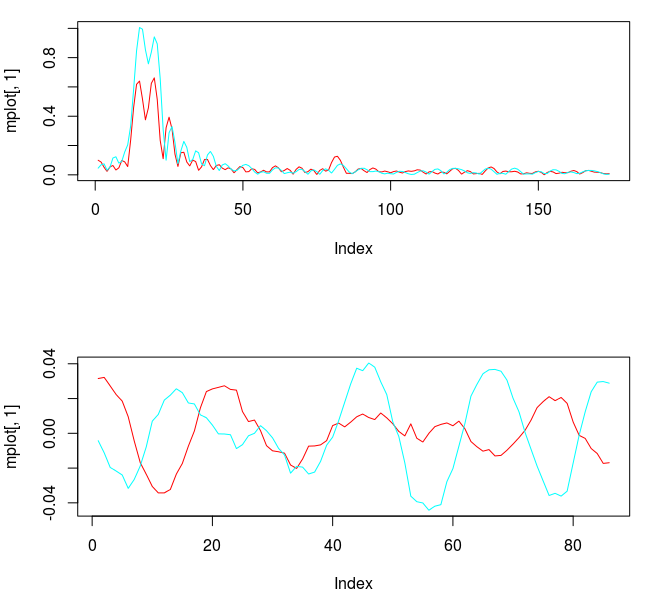 A Box-Cox transform, one of the more common transformations in financial and other non-stationary time series. (fractional)-differencing, defined by a value d in [0,1]. When d=1, standard first-order differencing is applied. For stationary series, standard mean-variance normalization or a more exotic GARCH normalization which attempts to model the underlying volatility is also available. Filter constraints i1 and i2: Constrains the filter coefficients to sum to one (i1) and/or the dot product with (0,1…, L) is equal to the phase shift, where L is the filter length. Phase-shift: the derivative of the frequency response function at the zero frequency. All these parameters are controlled in an MDFABase object, which holds all the information associated with the filtering process. It includes it’s own interface which ensures the MDFA filter coefficients are updated automatically anytime the user changes a parameter in real-time. As shown in Figure 1, the main components that need to be defined in order to define a signal extraction process in MDFA-Toolkit. The signal extraction process begins with a handle on the data streaming process, which in this article we will demonstrate using a simple CSV market file reader that is included in the package. The CSV file should contain the raw time series data, and ideally a time (or date) stamp column. In the case there is no time stamp column, such a stamp will simply be made up for each value. Once the data stream has been defined, these are then passed into a time series transformation process, which handles automatically all the data transformations which new data is streamed. As we’ll see, the TargetSeries object defines such transformations and all streaming data is passed added directly to the TargetSeries object. A MultivariateFXSeries is then initiated with references to each TargetSeries objects. The MDFABase objects contain the MDFA parameters and are added to the MultivariateFXSeries to produce the final signal extraction output. To demonstrate these components and how they come together, we illustrate the package with a simple example where we wish to extract three independent signals from AAPL daily open prices from the past 5 years. We also do this in a multivariate setting, to see how all the components interact, yielding a multivariate series -> multivariate signal. In the first line, we reference three data sources (AAPL daily open, GOOG daily open, and SPY daily open), where all signals are constructed from the target signal which is by default, the first series referenced in the data market feed. The second two series act as explanatory series. The filter coeffcients are computed using the latest 400 observations, since in this example 400 was used as the insample setSeriesLength, value for all signals. As a side note, different insample values can be used for each signal, which allows one to study the affects of insample data sizes on signal output quality. Figure 2 shows the resulting insample signals created from the latest 400 observations. We now add 600 more observations out-of-sample, chop off the first 400, and then see how one can change a couple of parameters on the first signal (first MDFABase object). After adding the 600 values out-of-sample and plotting, we then proceed to change the lowpass cutoff of the first signal to PI/6, and the lag to -3.0 (forecasting three steps ahead). This is done by accessing the MDFAFactory and getting handle on first signal (index 0), and setting the new parameters. The filter coefficients are then recomputed on the newest 400 values (but now all signal values are insample). In the MDFA-Toolkit, plotting is done using JFreeChart, however iMetricaFX provides an app for building signal extraction pipelines with this toolkit providing the backend where all the automated plotting, analysis, and graphics are handled in JavaFX, creating a much more interactive signal extraction environment. Many more features to the MDFA-Toolkit are being constantly added, especially in regard to features boosting applications in Machine Learning, such as we will see in the next upcoming article. We also implement in MDFA-Toolkit an interface to Apache Spark-TS, which provides a Spark RDD for Time series objects, geared towards high dimension multivariate time series. Large-scale time-series data shows up across a variety of domains. Distributed as the spark-ts package, a library developed by Cloudera’s Data Science team essentially enables analysis of data sets comprising millions of time series, each with millions of measurements. The Spark-TS package runs atop Apache Spark. A tutorial on creating an Apache Spark-TS connection with MDFA-Toolkit is currently being developed. My first open-source release of iMetrica for Linux Ubuntu 64 can now be downloaded at my Github, with a Windows 64 version soon to follow. iMetrica is a fast, interactive, GUI-oriented software suite for predictive modeling, multivariate time series analysis, real-time signal extraction, Bayesian financial econometrics, and much more. The principal use of iMetrica is to provide an interactive environment for the numerical and visual analysis of (multivariate) time series modeling, real-time filtering, and signal extraction. The interactive features in iMetrica boast a modeling and graphics environment for analysts, practitioners, and students of econometrics, finance, and real-time data analysis where no coding or modeling experience is necessary. All the system needs is data which can be piped into the system in many forms, including .csv, .txt, Google/Yahoo Finance, Quandle, .RData, and more. A module for connecting to MySQL databases is currently being developed. One can also simulate their own data from a one or a combination of several different popular data generating models. With the design intending to be interactive and self-enclosed, one can change modeling data/parameter inputs and see the effects in both graphical and numerical form automatically. This feature is designed to help understand the underlying mechanics of the modeling or filtering process. One can test many attributes of the modeling or filtering process this way both visually and numerically such as sensitivity, nonlinearity, goodness-of-fit, any overfitting issues, stability, etc. Random number generators from several different types of parameterized distributions to create shocks, outliers, regression components, etc. Construct mulitvariate MA filter designs, classical ARMA ZPA filtering designs, or hybrid filtering designs. Analyze all components of the filtering and signal extraction process, from time-delay and smoothing control, to regularization. Applies a fast adaptive EMD algorithm to decompose nonlinear, nonstationary data into a trend and instrinsic modes. Visualize all time-frequency components with automatically generated 2D heat maps. Automatically optimize certain components of the signal extraction on in-sample data. Tutorials on how to use iMetrica can be found on this blog and will be added on a weekly basis, with new tools, features, and modules being added and improved on a consistent basis. Please send any bug reports, comments, complaints, to clisztian@gmail.com. Figure 1: The TWS-iMetrica automated financial trading platform. Featuring fast performance optimization, analysis, and trading design features unique to iMetrica for building direct real-time filters to generate automated trading signals for nearly any tradeable financial asset. The system was built using Java, C, and the Interactive Brokers IB API in Java. I realize that I’ve been MIA (missing in action for non-anglophones) the past three months on this blog, but I assure you there has been good reason for my long absence. Not only have I developed a large slew of various optimization, analysis, and statistical tools in iMetrica for constructing high-performance financial trading signals geared towards intraday trading which I will (slowly) be sharing over the next several months (with some of the secret-sauce-recipes kept to myself and my current clients of course), but I have also built, engineered, tested, and finally put into commission on a daily basis the planet’s first automated financial trading platform completely based on the recently developed FT-AMDFA (adaptive multivariate direct filtering approach for financial trading). I introduce to you iMetrica’s little sister, TWS-iMetrica. 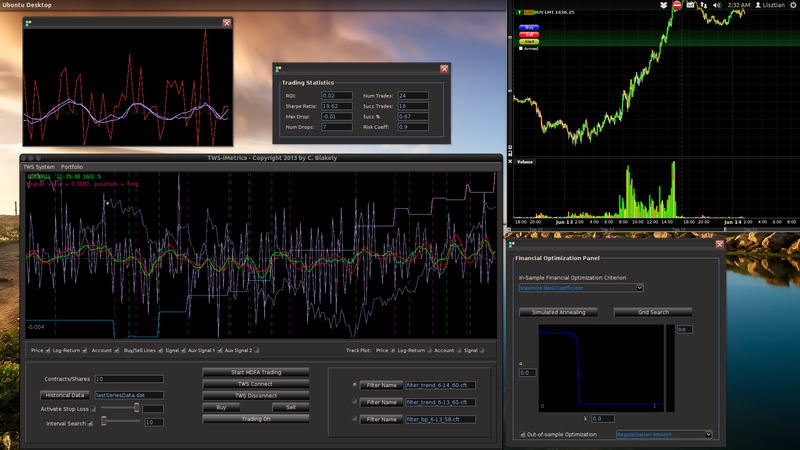 Coupled with the original software I developed for hybrid econometrics, time series analysis, signal extraction, and multivariate direct filter engineering called iMetrica, the TWS-iMetrica platform was built in a way to provide an easy to use yet powerful, adaptive, versatile, and automated trading machine for intraday financial trading with a variety of options for building your own day trading strategies using MDFA based on your own financial priorities. Being written completely in Java and gnu c, the TWS-iMetrica system currently uses the Interactive Brokers (IB) trading workstation (TWS) Java API in order to construct the automated trades, connect to the necessary historical data feeds, and provide a variety of tick data. Thus in order to run, the system will require an activated IB trading account. However, as I discuss in the conclusion of this article, the software was written in a way to be seamlessly adapted to any other brokerage/trading platform API, as long as the API is available in Java or has Java wrappers available. The first step to building an intraday trading environment is to construct what I call an MDFA portfolio (which I’ll define in a brief moment). This is achieved in the TWS-iMetrica interface that is endowed with a user-friendly portfolio construction panel shown below in Figure 4. With the desired MDFA portfolio, selected, one then proceeds in connecting TWS-iMetrica to IB by simply pressing the Connect button on the interface in order to download the historical data (see Figure 3). With the historical data saved, the iMetrica software is then used to upload the saved historical data and build the filters for the given portfolio using the MDFA module in iMetrica (see Figure 2). The filters are constructed using a sequence of proprietary MDFA optimization and analysis tools. Within the iMetrica MDFA module, three different types of filters can be built 1) a trend filter that extracts a fast moving trend 2) a band-pass filter for extracting local cycles, and 3) A multi-bandpass filter that extracts both a slow moving trend and local cycles simultaneously. Once the filters are constructed and saved in a file (a .cft file), the TWS-iMetrica system is ready to be used for intrady trading using the newly constructed and optimized filters (see Figure 6). 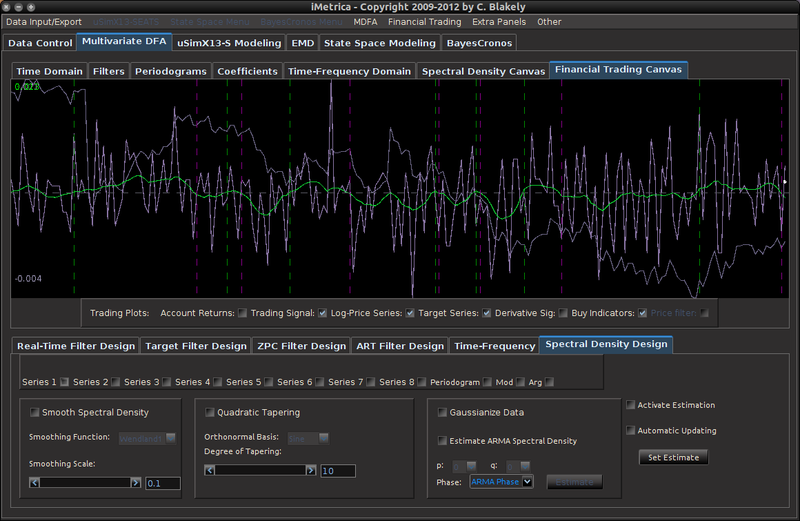 Figure 2: The iMetrica MDFA module for constructing the trading filters. Features dozens of design, analysis, and optimization components to fit the trading priorities of the user and is used in conjunction with the TWS-iMetrica interface. In the remaining part of this article, I give an overview of the main features of the TWS-iMetrica software and how easily one can create a high-performing automated trading strategy that fits the needs of the user. The main TWS-iMetrica graphical user interface is composed of several components that allow for constructing a multitude of various MDFA intraday trading strategies, depending on one’s trading priorities. Figure 3 shows the layout of the GUI after first being launched. The first component is the top menu featuring TWS System, some basic TWS connection variables which, in most cases, these variables are left in their default mode, and the Portfolio menu. To access the main menu for setting up the MDFA trading environment, click Setup MDFA Portfolio under the Portfolio menu. Once this is clicked, a panel is displayed (shown in Figure 4) featuring the required a priori parameters for building the MDFA trading environment that should all be filled before MDFA filter construction and trading is to take place. The parameters and their possible values are given below Figure 4. Figure 3 – The TWS-iMetrica interface when first launched and everything blank. Figure 4 – The Setup MDFA Portfolio panel featuring all the setting necessary to construct the automated trading MDFA environment. Portfolio – The portfolio is the basis for the MDFA trading platform and consists of two types of assets 1) The target asset from which we construct the trading signal, engineer the trades, and use in building the MDFA filter 2) The explanatory assets that provide the explanatory data for the target asset in the multivariate filter construction. Here, one can select up to four explanatory assets. Exchange – The exchange on which the assets are traded (according to IB). Asset Type – If the input portfolio is a selection of Stocks or Futures (Currencies and Options soon to be available). Expiration – If trading Futures, the expiration date of the contract, given as a six digit number of year then month (e.g. 201306 for June 2013). Shares/Contracts – The number of shares/contracts to trade (this number can also be changed throughout the trading day through the main panel). Observation frequency – In the MDFA financial trading method, we consider uniformly sampled observations of market data on which to do the trading (in seconds). The options are 1, 2, 3, 5, 15, 30, and 60 minute data. The default is 5 minutes. Historical Data – Selects how many days are used to for downloading the historical data to compute the initial MDFA filters. The historical data will of course come in intervals chosen in the observation frequency. Once all the values have been set for the MDFA portfolio, click the Set and Build button which will first begin to check if the values entered are valid and if so, create the necessary data sets for TWS-iMetrica to initialize trading. This all must be done while TWS-iMetrica is connected to IB (not set in trading mode however). If the build was successful, the historical data of the desired target financial asset up to the most recent observation in regular market trading hours will be plotted on the graphics canvas. The historical data will be saved to a file named (by default) “lastSeriesData.dat” and the data will be come in columns, where the first column is the date/time of the observation, the second column is the price of the target asset, and remaining columns are log-returns of the target and explanatory data. And that’s it, the system is now setup to be used for financial trading. These values entered in the Setup MDFA Portfolio will never have to be set again (unless changes to the MDFA portfolio are needed of course). Figure 5 – The main control panel for choosing and/or modifying all the options during intraday trading. In contracts/shares text field, one enters the amount of share (for stocks) or contracts (for futures) that one will trade throughout the day. This can be adjusted during the day while the automated trading is activated, however, one must be certain that at the end of the day, the balance between bought and shorted contracts is zero, otherwise, you risk keeping contracts or shares overnight into the next trading day.Typically, this is set at the beginning before automated trading takes place and left alone. The data input file for loading historical data. The name of this file determines where the historical data associated with the MDFA portfolio constructed will be stored. This historical data will be needed in order to build the MDFA filters. By default this is “lastSeriesData.dat”. Usually this doesn’t need to be modified. The stop-loss activation and stop-loss slider bar, one can turn on/off the stop-loss and the stop-loss amount. This value determines how/where a stop-loss will be triggered relative to the price being bought/sold at and is completely dependent on the asset being traded. The interval search that determines how and when the trades will be made when the selected MDFA signal triggers a buy/sell transaction. If turned off, the transaction (a limit order determined by the bid/ask) will be made at the exact time that the buy/sell signal is triggered by the filter. If turned on, the value in the text field next to it gives how often (in seconds) the trade looks for a better price to make the transaction. This search runs until the next observation for the MDFA filter. For example, if 5 minute return data is being used to do the trading, the search looks every n seconds for 5 minutes for a better price to make the given transaction. If at the end of the 5 minute period no better price has been found, the transaction is is made at the current ask/bid price. This feature has been shown to be quite useful during sideways or highly volatile markets. The middle of the main control panel features the main buttons for both connecting to disconnecting from Interactive Brokers, initiating the MDFA automated trading environment, as well as convenient buttons used for instantaneous buy/sell triggers that supplement the automated system. 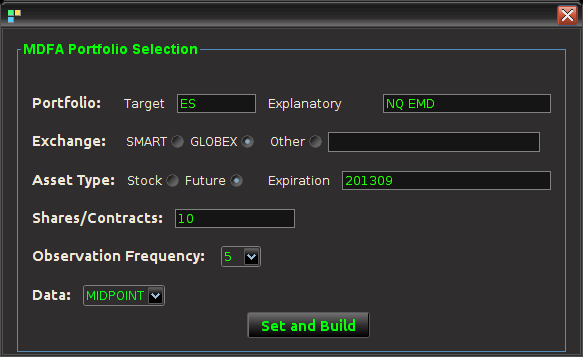 It also features an on/off toggle button for activating the trades given in the MDFA automated trading environment. When checked on, transactions according to the automated MDFA environment will proceed and go through to the IB account. If turned off, the real-time market data feeds and historical data will continue to be read into the TWS-iMetrica system and the signals according to the filters will be automatically computed, but no actual transactions/trades into the IB account will be made. Finally, on the right hand side of the main control panel features the filter uploading and selection boxes. These are the MDFA filters that are constructed using the MDFA module in iMetrica. One convenient and useful feature of TWS-iMetrica is the ability to utilize up to three direct real-time filters in parallel and to switch at any given moment during market hours between the filters. (Such a feature enhances the adaptability of the trading using MDFA filters. I’ll discuss more about this in further detail shortly). In order to select up to three filters simultaneously, there is a filter selection panel (shown in bottom right corner of Figure 6 below) displaying three separate file choosers and a radio button corresponding to each filter. Clicking on the filter load button produces a file dialog box from which one selects a filter (a *.cft file produced by iMetrica). Once the filter is loaded properly, on success, the name of the filter is displayed in the text box to the right, and the radio button to the left is enabled. With multiple filters loaded, to select between any of them, simply click on their respective radio button and the corresponding signal will be plotted on the plot canvas (assuming market data has been loaded into the TWS-iMetrica using the market data file upload and/or has been connected to the IB TWS for live market data feeds). This is shown in Figure 6. 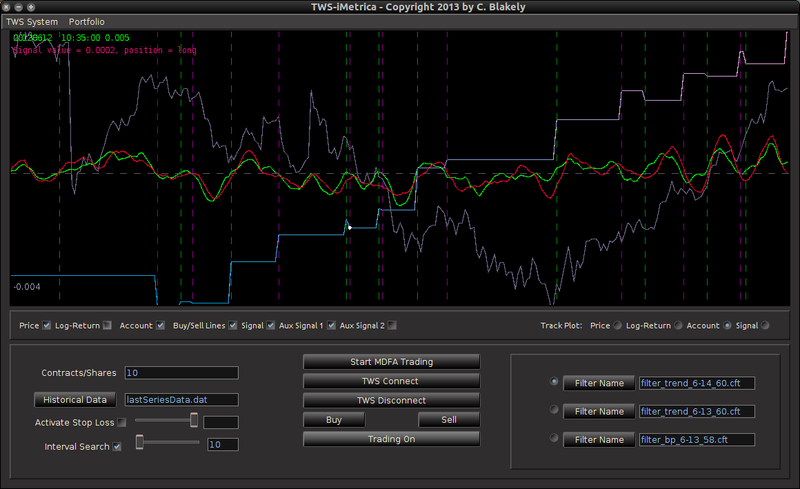 Figure 6 – The TWS-iMetrica main trading interface features many control options to design your own automated MDFA trading strategies. Figure 8 – The plots for the trading interface. Features price, log-return, account cumulative returns, signal, buy/sell lines, and up to two additional auxiliary signals. Price – Plots in real-time the price of the asset being traded, at the specific observation frequency selected for the MDFA portfolio. 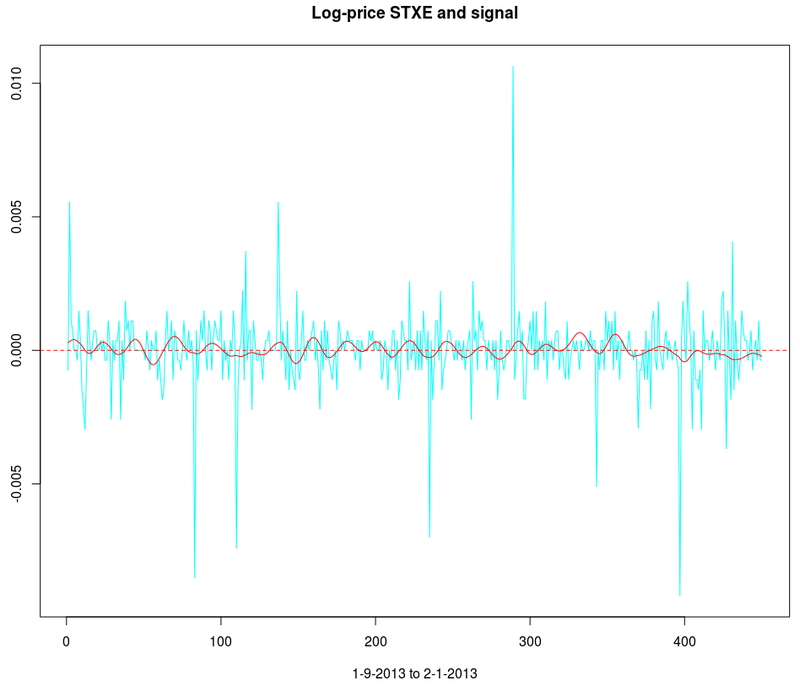 Log-returns – Plots in real-time the log-returns of the price, which is the data that is being filtered to construct the trading signal. 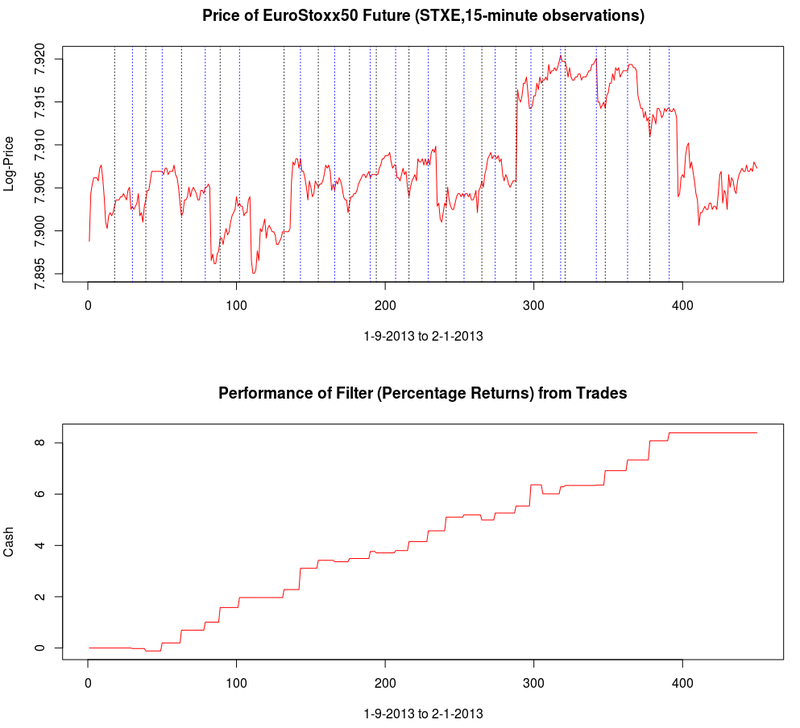 Account – Shows the cumulative returns produced by the currently chosen MDFA filter over the current and historical data period (note that this does not necessary reflect the actual returns made by the strategy in IB, just the theoretical returns over time if this particular filter had been used). Buy/Sell lines – Shows dashed lines where the MDFA trading signal has produced a buy/sell transaction. The green lines are the buy signals (entered a long position) and magenta lines are the sell (entered a short position). Signal – The plot of the signal in real-time. When new data becomes available, the signal is automatically computed and replotted in real-time. This gives one the ability to closely monitory how the current filter is reacting to the incoming data. Aux Signal 1/2 – (If available) Plots of the other available signals produced by the (up to two) other filters constructed and entered in the system. To make either of these auxillary signals the main trading signal simply select the filter associated with the signal using the radio buttons in the filter selection panel. Along with these plots, to track specific values of any of these plots at anytime, select the desired plot in the Track Plot region of the panel bar. Once selected, specific values and their respective times/dates are displayed in the upper left corner of the plot panel by simply placing the mouse cursor over the plot panel. A small tracking ball will then be moved along the specific plot in accordance with movements by the mouse cursor. With the graphics panel displaying the performance in real-time of each filter, one can seamlessly switch between a band-pass filter or a timely trend (low-pass) filter according to the changing intraday market conditions. To give an example, suppose at early morning trading hours there is an unusual high amount of volume pushing an uptrend or pulling a downtrend. In such conditions a trend filter is much more appropriate, being able to follow the large-variation in log-returns much better than a band-pass filter can. One can glean from the effects of the trend filter on the morning hours of the market. After automated trading using the trend filter, with the volume diffusing into the noon hour, the band-pass filter can then be applied in order to extract and trade at certain low frequency cycles in the log-return data. Towards the end of the day, with volume continuously picking up, the trend filter can then be selected again in order to track and trade any trending movement automatically. I am in the process of currently building an automated algorithm to “intelligently” switch between the uploaded filters according to the instantaneous market conditions (with triggering of the switching being set by volume and volatility. Otherwise, for the time being, currently the user must manually switch between different filters, if such switching is at all desired (in most cases, I prefer to leave one filter running all day. Since the process is automated, I prefer to have minimal (if any) interaction with the software during the day while it’s in automated trading mode). As I mentioned earlier, the main components of the TWS-iMetrica were written in a way to be adaptable to other brokerage/trading APIs. The only major condition is that the API either be available in Java, or at least have (possibly third-party?) wrappers available in Java. That being said, there are only three main types of general calls that are made automated to the connected broker 1) retrieve historical data for any asset(s), at any given time, at most commonly used observation frequencies (e.g. 1 min, 5 min, 10 min, etc. ), 2) subscribe to automatic feed of bar/tick data to retrieve latest OHLC and bid/ask data, and finally 3) Place an order (buy/sell) to the broker with different any order conditions (limit, stop-loss, market order, etc.) for any given asset. If you are interested in having TWS-iMetrica be built for your particular brokerage/trading platform (other than IB of course) and the above conditions for the API are met, I am more than happy to be hired at certain fixed compensation, simply get in contact with me. If you are interested seeing how well the automated system has performed thus far, interested in future collaboration, or becoming a client in order to use the TWS-iMetrica platform, feel free to contact me as well.